Dangerous hypocrisy was on display yesterday as multiple politicians marched to advocate of stripping you of your gun rights while they were completely surrounded by guns. According to his own website, under Governor Andrew Cuomo, New York has passed the strongest gun control laws in the nation. Cuomo openly advocates for enacting the toughest gun bans in the nation, the toughest bans on magazines, and even banning the internet sale of ammunition in the state. By all definitions, Andrew Cuomo is a staunch anti-gun rights activist. It is his stance on eliminating gun rights that was the impetus for him joining the thousands of students in the #walkout yesterday. But, like most politicians, his hypocrisy was on full display. On Wednesday, millions of students, politicians, and activists alike marched across America to demand the government take away their rights. This move was promoted by the government, boosted by the mainstream media, and even accepted by school systems across the country. By no means was this a show of resistance. It was, however, an act of hypocrisy for politicians. On Wednesday, Andrew Cuomo walked down the streets of New York to join activists in a die-in and demand stricter gun laws. Activists chanted “enough is enough” as they used the tragedy in Parkland, Florida as a reason to demand innocent, law-abiding Americans give up their guns. How easy it must be to call for others to be disarmed while a half-dozen armed security officers carry weapons that are illegal for the citizens to even purchase, all to protect you. One Twitter user made a perfect point about Cuomo’s hypocrisy on taking guns from you while keeping them for himself. Protests you having guns while surrounded by armed government agents. This is the person the 2nd Amendment was written to protect us against. Thank you Franklin, Washington, Jefferson and Adams…. Cuomo was not alone in his hypocrisy either. 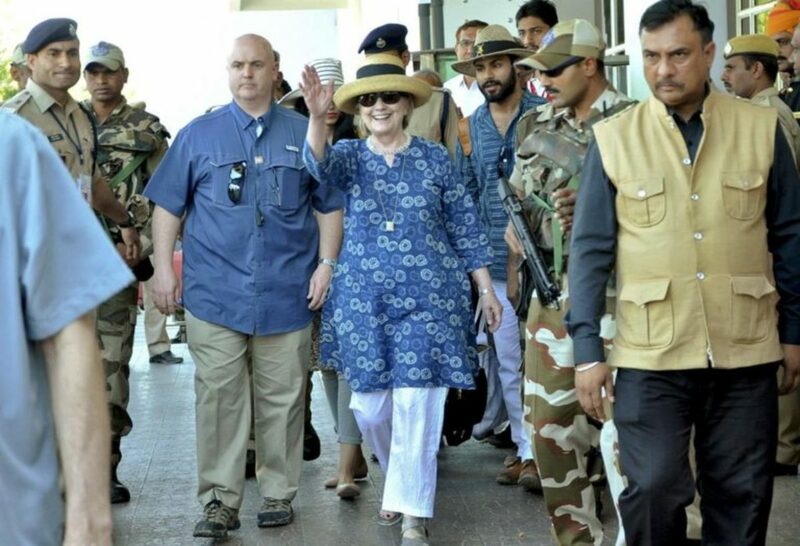 Hillary Clinton also stepped out while on a trip to India to call for disarming the citizens. Like Cuomo, Clinton was surrounded by guns. But she took it a step further and surrounded herself with men armed with fully automatic rifles. It’s not just politicians who call for removing your right to self-defense while hypocritically clenching to theirs. As TFTP reported earlier this month, Hollywood’s elite gathered for the massive glorification of celebrity at the 90th Annual Oscars celebration. While there were multiple politically charged themes like #metoo and Time’s Up movements, one theme, in particular, highlighted the blatant hypocritical nature of these extremely rich celebrities. Gun control. This time, however, as celebrities donned their orange pins and blasted gun rights, their hypocrisy, just like Cuomo and Clinton, was on full display. Like the politicians who call for private citizens to be stripped of their right to self-defense, the celebrities in Hollywood failed to realize that they are constantly surrounded by guns. I challenge those in attendance to the Oscars who plan to speak on gun control to get rid of their armed security details. If you want us to get rid of our guns, you can’t be protected by them. Indeed, while the Hollywood bigwigs patted themselves on their backs by celebrating their movies inside, hundreds of heavily militarized police officers protected them by celebrating the police state outside. Roads were closed and a security perimeter made up of ten-foot gates and barricades was set up as FBI agents, firefighters, hundreds of police officers, and helicopters swarmed the area, protecting the elite stars inside the Dolby Theatre—with guns. If politicians, celebrities, and the media were truly concerned with preventing mass shootings and attacks in America, then they would be addressing the association with psychotropic drugs that Big Pharma has paid hundreds of millions of dollars to cover up. But then again, if they did that, who would pay for their re-election campaigns?